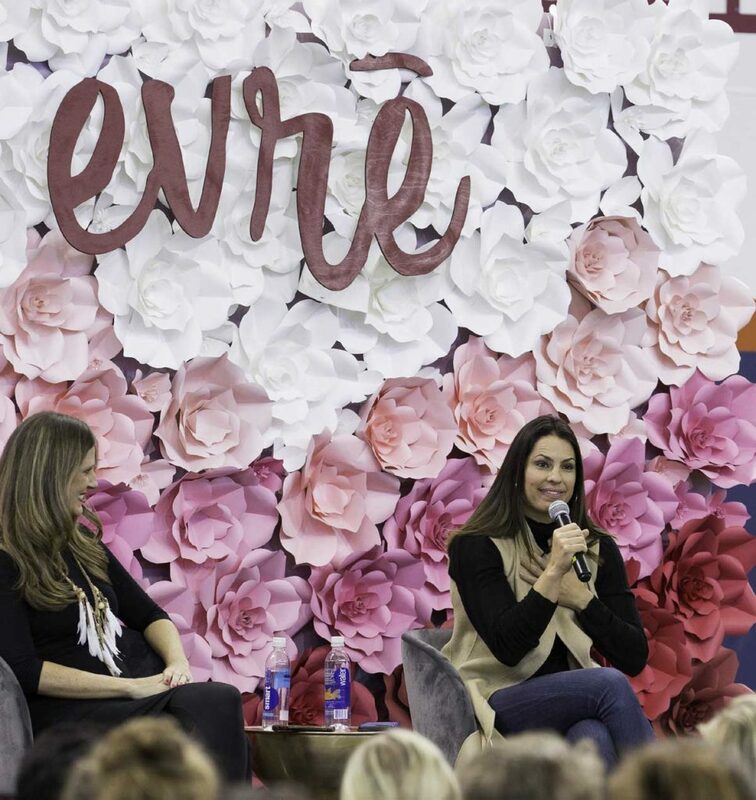 During evrē, UCHealth ‘self-care Saturday’ women’s health event, the first woman to clinch a spot in MLB’s broadcast booth urged women to fight for their goals. Jessica Mendoza is the first woman to work as an ESPN commentator in the booth for Major League Baseball. She said she had to fight hard for her job. Photo by Jen Ross for UCHealth. Jessica Mendoza had to push her way into the all-male box as the first female Major League Baseball analyst for ESPN and host of Sunday Night Baseball with baseball legend, Alex Rodriguez. Mendoza advises other women to fight for what they want too. “I am me. I battled it. I was pushy and I’m labeled,” Mendoza said. Fittingly, Mendoza made her remarks about pushing into male-dominated territory on a practice field that usually is full of big, burly Denver Broncos players. 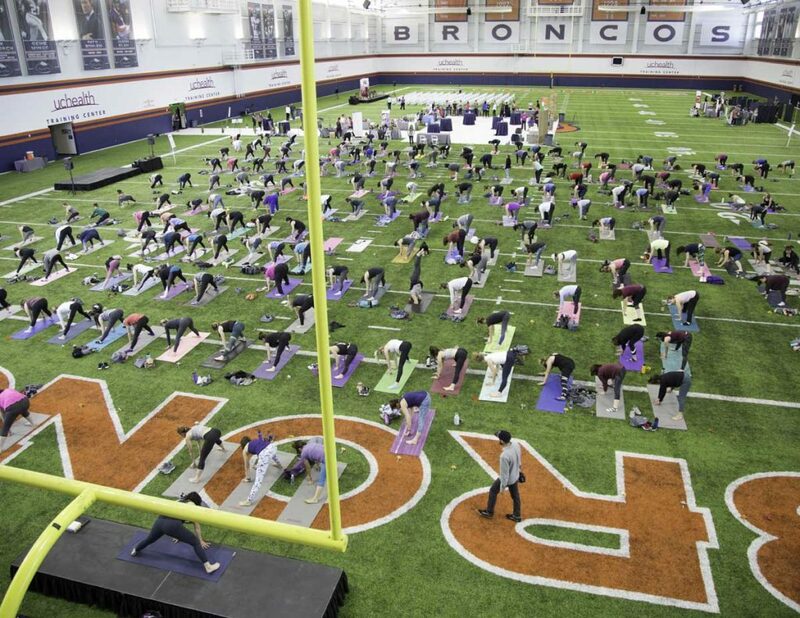 On Saturday, more than 300 women hit the turf, enjoying fitness classes, inspiring talks, health screenings and a “self-care Saturday” at the UCHealth Training Center in Englewood, where the Broncos hold their practice sessions. Mendoza said women long have been relegated to limited roles as sideline reporters for major-league sports events, but breaking into the announcers’ box took years of dogged determination. Women took over the Denver Broncos’ turf at the UCHealth Training Center during a women’s health event on Saturday. Photo by Jen Ross for UCHealth. She credits her dad, Gil Mendoza, for raising strong children, including one son and three daughters. He was a baseball and football coach at southern California high schools and at Moorpark College north of Los Angeles. Jessica hung out at practices and always was surrounded by male athletes. Her dad ran plenty of practices for his kids too, teaching them how to hit, field balls and play shortstop and in the outfield. Even time at the beach turned into practice sessions. Gil Mendoza would send tennis balls flying into the air. The kids had to guess where the balls would land and run out to that spot. If the balls landed on them, they got ice cream, Jessica Mendoza once told the Ventura County Star. For her, being fierce comes naturally. Mendoza went on to play softball at Stanford University, where she was a four-time, first team All American. She then won gold and silver medals respectively at the 2004 and 2008 Olympics in Athens and Beijing. Always an outstanding hitter, Mendoza has brought that same competitive drive to broadcasting. She said women don’t need to be humble or polite, constantly thanking bosses for opportunities. Instead, she said women should set their sights high, raise their voices and seize chances to succeed. “I can’t go through life without speaking up,” she said. Mendoza fought for her spot in the booth for years. She said her bosses never refused her outright, but kept making excuses. “They said, ‘people are going to say bad things’ about me. That made me want to fight more. I am the only female in the room all the time and most of the time, I don’t notice. They do,” Mendoza said. She refuses to listen to critics who focus on her gender. Instead, she works to be the most prepared commentator in the booth, rigorously studying for every broadcast so she can give fans what they want: top-notch analysis. Mendoza got her first shot in the booth in August of 2015 for a game between the Cardinals and the Diamondbacks. A few days later, ESPN color commentator, Curt Schilling, was suspended and ESPN producers put Mendoza on their premiere show, Sunday Night Baseball. 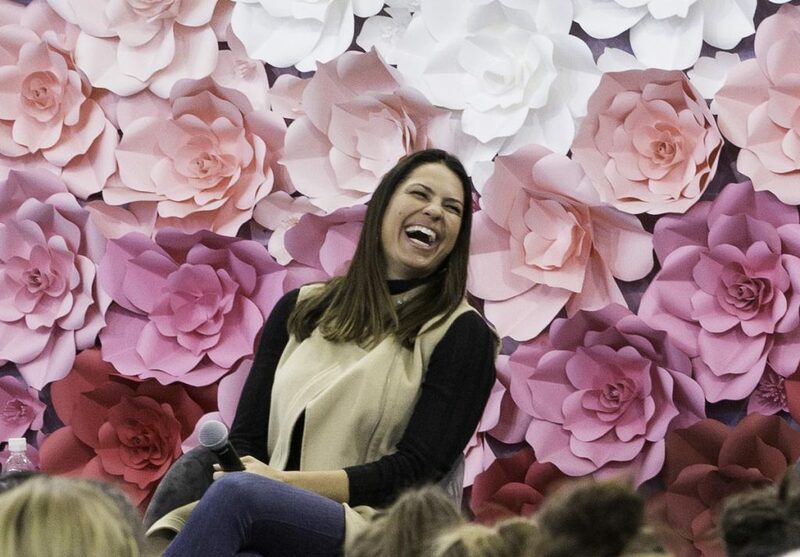 Olympian and ESPN baseball commentator Jessica Mendoza speaks during UCHealth’s women’s health event called evrē. To Mendoza’s left is Amy Jo Martin, a social media pioneer and mentor for female entrepreneurs. Photo by Jen Ross for UCHealth. The matchup that night between the Cubs and the Dodgers wasn’t supposed to be an attention-grabbing game, but Cubs pitcher Jake Arrieta threw a no-hitter and Mendoza dazzled the audience as a standout voice in the booth. Twitter blew up. There were plenty of sexist trolls who attacked Mendoza. “I heard a woman’s voice and it’s a men’s sport,” Mendoza recalled hearing. The reaction ranged from positive to deranged: “‘This is amazing,’ and, ‘Oh my God, I want to kill you,’” Mendoza said. “The geographic change of me moving from the field to the booth, I didn’t even realize the storm that would create,” she said. To stay centered, Mendoza listened to those she respected – experienced sports broadcasters and fellow athletes she long has admired. And she tunes out the haters. In January of 2016, ESPN rewarded her with a permanent slot on Sunday Night Baseball. Mendoza had pushed and clinched her dream. “My voice matters and I know it’s good,” she said. At home with her husband and two sons, Mendoza disconnects from social media whenever she gets the chance and loves disappearing on long walks. The importance of disconnecting was a big theme during evrē. Joining Mendoza as a keynote panelist was Amy Jo Martin, a social media pioneer who taught celebrities like Shaquille O’Neal and Dwayne ‘The Rock’ Johnson how to humanize their social media feeds. Martin is the author of the New York Times bestseller, Renegades Write the Rules and hosts the podcast, Why Not Now? While Martin loves nurturing other young female entrepreneurs, she also shared her darkest moments and warned of burnout. During her peak years, Martin said she was averaging about four hours of sleep a night as she raced around the country, taking about 210 flights a year. Her business was thriving. She had employees around the world. “It looked great from the outside,” Martin said. But on the inside, she was falling apart. “My marriage and health were on the rocks,” she said. She found herself at John F. Kennedy Airport and couldn’t remember for a moment where she was flying. She grabbed a cup of coffee to pump herself up. Martin disconnected completely, spent extended time on a sailboat and the Wyoming native now lives in South Dakota, where she sometimes sees more animals than people each day. She meditates regularly, has slowed down dramatically and now is expecting her first baby. When women live more balanced lives, Martin said, the “hustle turns into more play. It becomes a dance instead of a fight or a struggle. I’ve been trying to dance more,” she said. To help women focus more on themselves, evrē included fitness classes, healthy foods and a session with goal coach, Jacki Carr. “I used to think self care was a luxury,” Carr told the women. 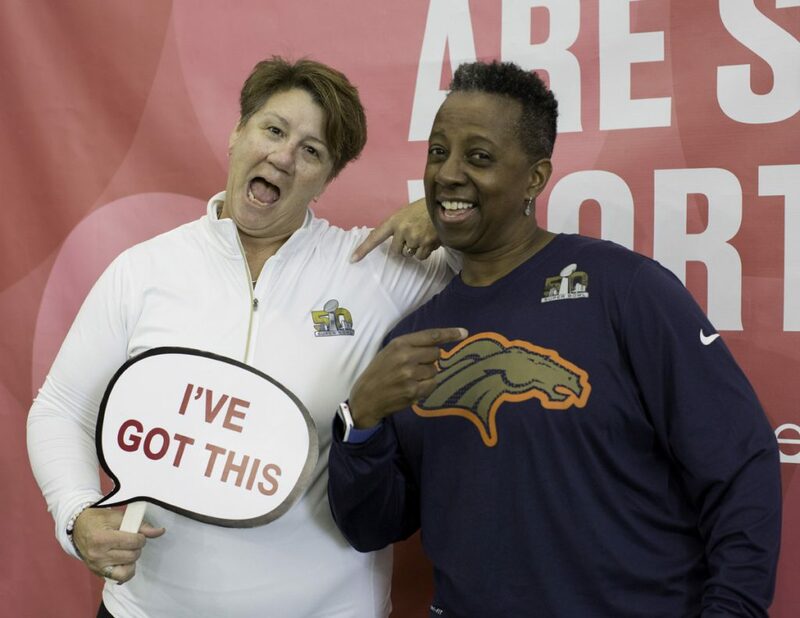 A motivational photo booth was one of the activities at UCHealth’s ‘self-care Saturday’ women’s health event, evrē. Photo by Jen Ross for UCHealth. In an echo chamber of celebrity and social media culture, women sometimes get caught up in what others are doing or achieving. Carr said women should instead focus on what makes them feel strong. If you’re an introvert, be alone. If service matters to you, make that a priority. In order to stick with a path that matters to you, write down your goals, Carr said. A meaningful goal must be specific and must include a date by which you’ll achieve it. “Why? We make it happen and we scare ourselves a bit,” Carr said. She checks in on her goals at the start of each new season. Others check in once a month on the day they were born. It’s important to reassess goals. If you haven’t achieved a goal and it’s no longer relevant, nix it. If the goal still matters, but you haven’t achieved it, create a new due date. And get back to making it happen. For one young woman at the event, meeting one of her heroes was a bonus of attending evrē. Elisa Davis of Denver used to play softball. After Mendoza spoke, she went up to meet her and asked if she could give her a hug. She told the softball star that when she was younger, she and her friends used to pretend to be Mendoza. If they were facing a tough opponent they would tell each other they planned to “Mendoza” the ball, their term for smacking a big hit. Davis told Mendoza that whenever critics are trying to cut her down, she should block them out and instead think of all her young fans. “There are lots of little girls out there who are pretending to be you,” Davis said.